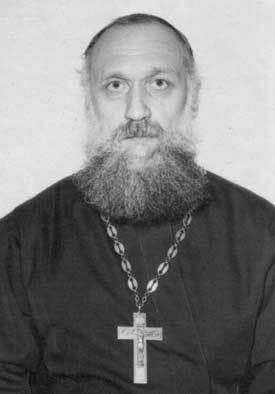 Archpriest Alexander Zharkoff was born on 12th February 1946. He graduated from the Leningrad Theological Seminary. He served in various churches in the Leningrad region, and since 1981 he had served in the small wooden church of St. Alexander Nevsky in Shuvalovo, on the outskirts of the city. In 1990 he became the rector of this church. Batioushka Father Alexander was very humble. He did not seek human glory. He had neither the desire nor the ability to make long impressive speeches - he spoke briefly. However, he never refused to give advice to those who came to him, never looked down on them, he was very simple and approachable and this especially drew people to him. Anyone who received any amount of guidance from him testified to the undeniable spiritual benefit they received from his advice and the power of his prayer. He dressed very modestly. He served simply, without pomposity, his faith was deep rather than on the surface, without vivid outward manifestations. Everyone, particularly people far from the Church and simple people, felt this deep faith in him and valued him precisely as a priest. There was no small number of people who turned more deeply to Orthodoxy due to the influence of a brief talk with Batioushka after a service or funeral. In fact almost everyone who had the good fortune to come into some close contact with him - be they believing, weak in faith or completely unbelieving and far from the Church, learned or simple and uneducated - all were drawn to him by feelings of respect and trust, although he never deliberately tried to make anyone like him. He simply had a certain light in him, and people perceived that with their hearts. On 6th February 1993 Father Alexander blessed Municipal Hospital No. 3 in honour of the Holy Nun Martyr, the Grand Duchess Elizabeth, and there in a little room set aside as a chapel regular church services were begun, at which the in-patients were given Holy Communion. A little before this, regular funeral services had been begun in the hospital mortuary. The chapel brought in virtually no income, and was maintained for purposes of religious instruction, while Batioushka used the money received from funerals for repairing the church. We should note that Father Alexander himself lived in poverty. He, his wife, his daughter, his mother-in-law, a huge dog and a cat lived in a tiny two-room apartment at the top of a five floor apartment building in Gatchina (almost 2 hours from the parish). Once there was a fire in the apartment; the entry door was burned through and the vestibule caught fire, and it was about a month before he could put in a new door. After completing the costly work in the church (gilding the iconostas) Batioushka decided to build a new church next to the hospital he had blessed. On 9th March 1994 a cross was blessed on the site of the future church. The diocese contributed no money towards the construction, nor could major sponsors be found. Batioushka had started looking for sponsors, but then gave up and the building was paid for with borrowed funds. Beginning in about 1993, Batioushka began studying the questions of ecumenism. He did not go very deeply into fine points of dogmatics, but rather intuitively and in simplicity came to the conclusion that union with the non-Orthodox is repugnant, that it is a betrayal of Orthodoxy. Here he thought that when the Patriarchate finally falls into impiety he would be able to separate from it with his new church. He had no doubt that sooner or later the Patriarchate would fall into impiety, and he could see that this process had been afoot for a long time. For a while Batioushka remained rector of two churches, the old one and the one that was under construction. Then at his request a new rector was appointed to the church of St. Alexander Nevsky, and Batioushka continued the construction of the church of St. Elizabeth. Regular services began there at the feast of the Nativity of Christ in 1997. After a while complaints were made to the diocesan authorities that Father Alexander was supposedly making huge amounts of money in the mortuary, "swimming in gold, not building a thing," and, most importantly, not sharing it with the Metropolitan. Figures were quoted of 18 funerals a day on average, at 200 dollars each. In fact there were no more than a few funerals each day, and none on some days, while they cost many times less, and were sometimes conducted for nothing. But surprisingly Metropolitan Vladimir Kotliaroff readily believed the report and appointed a new rector to the church, Father Valery Dorokhoff, an old and close friend from their days in Rostov. Batioushka was transferred to Vsevolozhsk (four hours' journey from Gatchina). The Metropolitan spoke very crudely to him. 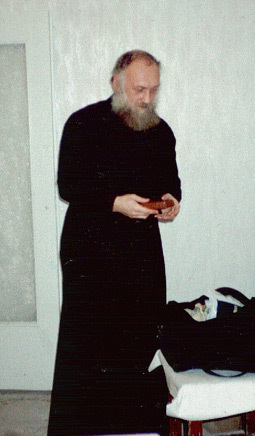 Batioushka immediately took official retirement and began to study the various ways of leaving the Moscow Patriarchate. Now that the very existence of the parish was threatened, the decision to leave the Patriarchate came naturally; its hierarchs had long since begun to depart from the purity of Orthodoxy, so there were no canonical hindrances to leaving. Once Dorokhoff had familiarized himself with the material condition of the parish he was bitterly disappointed. There were not that many parishioners and the income from the church was small. Dorokhoff tried to take over the funerals, but financial inducements to the mortuary workers were of no avail - they knew and loved Batioushka. Father Alexander himself had no plans to give up the church, how could he abandon his own offspring? When those who loved him saw the persecution raised up against him and asked, "Surely your are not going to abandon us?" he always answered, "No, I am not leaving here, I will be here until death." It was clear that no one besides Batioushka would be able to carry on the building - the interior work had to be finished as well as the bell tower. They tried to appoint Batioushka as assistant priest, at which point the Metropolitan used threatening language towards him; it was veiled in humour, but the meaning was perfectly clear. Dorokhoff in turn made much more concrete threats, not only towards Batioushka, but also to some members of the parish, which they managed to record on a tape-recorder. Dorokhoff at first tried to lure each member of the parish individually over to his side, by first making various promises, then frightening them. Batioushka categorically refused to concelebrate with Dorokhoff, but did not take the threats seriously, in his innocent, kind hearted way he could not believe that such things were really possible. But his faithful children and helpers nevertheless became very concerned. Meanwhile Dorokhoff, seeing that they had no desire to leave Batioushka, decided to adopt radical measures. At the beginning of July all the members of the parish assembly were driven out without any explanation, so the planned meeting never took place. Batioushka was received into the Russian Orthodox Church Abroad on 24th June 1997. The greater part of the parish transferred with him. At the same time the quantity of scandalous rumours surrounding Batioushka sharply increased. Besides accusations of being connected with the Russian "mafia" (although he had no mafia-related interests of any kind) he was accused of self-interest and of wanting to keep the church building for himself rather than showing obedience to the Metropolitan. In fact, in making this move Batioushka was attempting in the way he could to combat the embezzlement, corruption and profanation of Orthodoxy which he found in the Partiarchate. Besides which, taking account of the possibility that the Moscow Patriarchate would fall away from the purity of the faith in the near future, it would have been a sin to hand the church building over to heretics. Immediately after transferring into the Church Abroad, Batioushka set about having the parish registered. But despite all his lawyer's efforts, the registration was refused. More and more information was demanded, and it was obvious the process was deliberately being drawn out. Meanwhile, Dorokhoff announced from the ambo in church that Batioushka had built the church with money "from the people Abroad" and that as a consequence they had naturally ordered him to go over to them. Dorokhoff actively spread propaganda against Batioushka among the parishioners of the church. Unfortunately, people believed him. Although the new rector drove an imported car and put all the money from the church into his own pocket each day, he still spoke beautifully and, as one female parishioner put it, "you could have a good listen." Various rumours began to spread about Batioushka among the people: "He's sold himself abroad," "He's gone to bury foreign dead people," "He's got involved with the American church." The choir director, who had gone over to Dorokhoff's side, came to just one service in the old church of St. Alexander Nevsky where Batioushka was remembered and loved and where she had herself sung in the choir at one time, and the parishioners learned with horror that Batioushka had become so heavily involved with the Mafia that he was now trading in human organs from the mortuary. It was indeed strange that such a stupid slander - you don't have to be a doctor to know that it is technically impossible - had such a strong effect on those that heard it and sowed seeds of doubt in them. A good deal of other nonsense was said about Batioushka. At first he was broken in spirit: "What malice there is all round!" But later he was less upset, and whenever he heard the latest news about himself, he just shrugged his shoulders at all these slanders. On 6th September representatives of the commercial crimes unit paid a visit, acting on "information" received. At first they behaved very harshly. They pinioned one priest to the wall and searched him in the presence of mourners who had come to their deceased relative's funeral. Father Alexander and another priest of the Church Abroad, as well as the woman selling candles, were taken away to headquarters. There the interrogator said they would be locked up in a cell. "Well that's good, we will serve in there," said Batioushka. "Who will you serve for?" asked the astonished interrogator. "For the Lord God." "How?" "According to the typicon - the appointed order for church services." Half way through the interrogation, the policemen relented. One of them said to Batioushka, "We don't need you, you're just getting in someone's way." They sealed the priest's room in the mortuary but did not seal the chapel in the hospital. The hospital administration was compelled to seal off the chapel on written orders received from the Metropolitan. Shortly before this, some supporters of the Patriarchate collected signatures from the patients. People far from the Church were asked questions such as, "Do you want the Orthodox chapel to be occupied by the Foreign Church Abroad?" The majority, reacting to the word "Abroad," answered in the negative, assuming that these must be Baptists or Jehovah's Witnesses. Metropolitan Vladimir wrote to the head physician of the hospital saying that "suspended priests" were serving in the chapel and "slandering the Patriarch." The chapel was sealed off, to the great astonishment and grief of the hospital workers and the patients, for whom this was virtually the only bright spot in the hospital, a place where they could confess and receive Holy Communion, pray, light candles, borrow books to read and receive some comfort through talking to the people working there. Despite everything, the process of securing the registration of the parish of the Russian Church Abroad was moving closer to success. The attitude of the mortuary workers and hospital administration towards Batioushka had not changed, perhaps it had even become more favourable when they saw the campaign of unjust slander being unleashed by the Patriarchate. On 15th August the builders sealed off the church due to unpaid bills. The builders had come to the conclusion that only Batioushka would serve in the church, which was his life's work. They agreed to await payment by installments from Batioushka, but Valery Dorokhoff had no intention of either paying or continuing with the building. With a group of parishioners faithful to him, he tried to break in to the church, but the builders would not let him in; they just allowed him to collect his personal belongings, and then sealed off the church again. Everyone was just waiting for the registration to come through so that the church could begin its normal life. Batioushka made plans for building a church house and for opening a Sunday school at the church. On 12th September he celebrated his names day, the feast of St. Alexander Nevsky, and a day later he was no more. On 14th September he left home at about 6 in the morning. He told matushka that he would be back in the afternoon. When he was not back by evening she became worried. When she phoned through to the mortuaries enquiry line, she was told that a corpse with similar features had been brought in the Tsarskoe Selo morgue - a motor vehicle accident, they said. In the morning she went there and identified Father Alexander's body. The pathologist discovered bullet wounds, which refuted the "MVA" theory. Probably they had been waiting for Batioushka on his way to the electric train. The examination showed that the murder had been carried out "by all the rules" - a shot in the chest and another ("just to make sure") in the head. After that the body had been driven over several times with a car, which made it look like a motor vehicle accident, so that the autopsy was only begun two days later. Batioushka has departed to a better world where, we hope, he will receive a righteous reward for all his labours and sufferings which he endured in his earthly life; for enduring slanders, for his humility, his forgiving nature and his selfless service to the Church, which were always his distinguishing features, for the light which he gave to people, and for his martyr's end.